I have to say when I was first introduced to the concept of treated fungus nails with a laser I was very skeptical. I have been in practice since 1967, and onychomycosis(fungus nails) has always been difficult, if not impossible, to treat. I have been a fellow of American Society of Laser Medicine and Surgery for over 30 years, and in that time we have tried different methods of lasering fungus nails with no success. It is only since the Yag laser has been tried for this condition that there has been any hope. We have tried every conceivable topical with little or no success (about 8%), and orals like Lamisil work about half the time. The risks and side effects of Lamisil, however, may rule this out as a wise choice, since only certain fungi are susceptabile to oral medication, and the side effects thou reversible are not pleasant. Use of Statins and other medications usually eliminate oral medications as a viable option. I started treating patients with the Pin Pointe laser almost 4 years ago, and did get some very good results. The modality was somewhat primitive in nature without a temperature sensor, and only a subject way of evaluating efficacy at the time of treatment. I was recently introduced to the Q-Clear laser and it was like going from a moped to a Cadillac. The treatment is a same day procedure that can be rendered in less than a third of the time that it took the older laser model, it is completely pain free, and easy to use, which explains my choice of switching to the Q-Clear laser. My patients and I are delighted with the results, and with the ease of treatment. If you are tired of living with unsightly nail fungus call today to make an appointment 407-423-1234 or visit our laser website to learn more. If so you may suffer from onychomycosis, a condition also known as toenail fungus. Until now, the only solutions for toenail fungus were to surgically remove the nail, apply topical treatments, which have poor success rate; or more recently, prescription medications, which have many potentially dangerous side effects. The Light Age Q-Clear laser treatment can effectively rid your toenails of unsightly toenail fungus in as little as one or two treatments, depending on the severity of the condition. The mid-infrared laser wavelength penetrates the nail, eliminating the destructive fungus that causes the infection and revitalizing your nail as it grows out. Why choose the Q-Clear laser treatment? Q-Clear is an effective, quick treatment that provides results. 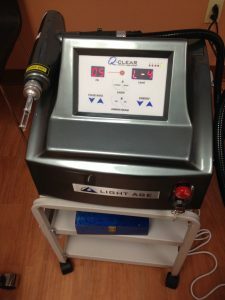 Q-Clear is a pioneer in the laser industry creating the first pain free laser treatment. Please remove your nail polish the day prior to receiving your treatment as your toenails will be cleaned and filed prior to the laser treatment. As each toe is treated with the laser you will feel no pain. The laser treatment will take about 20 minutes to treat both feet. The physician will discuss post-treatment care to avoid fungal re-infection. Can I have the treatment done if I am pregnant? Can I have treatment on a partial nail? Can I go back to work after the treatment? Are there any activity restrictions? Yes you can return to work immediately following the procedure there are also no restrictions on activities after the procedure.